Our test seal stands for highest quality of testing and the assurance that the tested food or water is free from unhealthy substances and germs. You will find the test seal on many products and households we have tested. Companies that have their products tested by us receive the test seal along with a detailed test report in print quality or as stickers for their products. 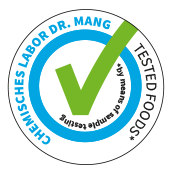 Naturally, the test seal is only awared to products that have passed our rigorous testing without ambiguity. Are you a food manufacturer or food selling business? Have your products tested now! Chemical components, constituents, metals, etc. 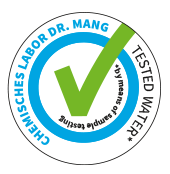 Are you interested in the quality of your drinking water? Get it tested now! We give out our test seals after a passed test as a production-ready file. This way you can label your products with the test seal in the production chain without extra effort. Alternatively, we can offer you ready-made stickers and other marketing materials. Please feel free to ask us!